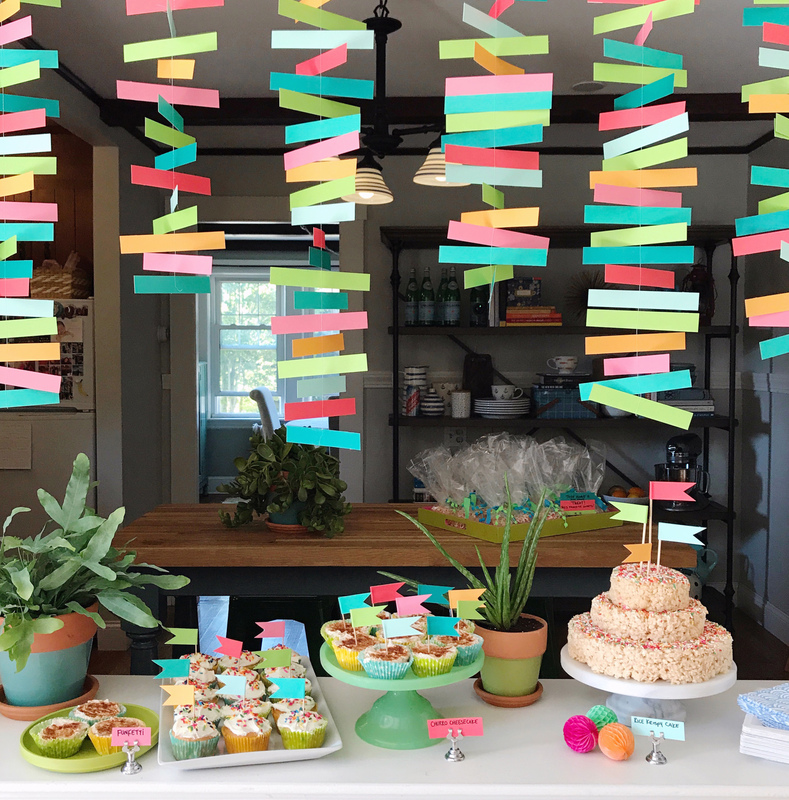 Over the weekend, my girlfriends and I hosted a super-colorful, taco and treat-filled baby shower for our best friend Taz, and it was a blast — I couldn’t wait to snap pictures and share them here! When it comes to throwing showers, I always like to think about the guest of honor’s favorite things and build a theme around some of them. For Taz, she’s the queen of color, a collector of all things bright and bold and punchy, and a devotee of guacamole-topped Mexican food. 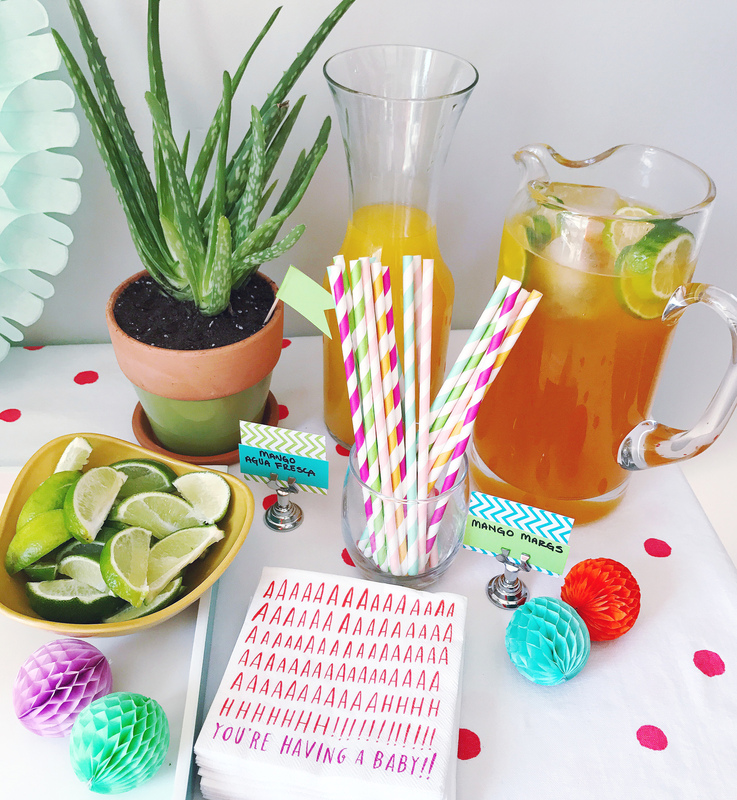 We decided a fiesta-inspired theme would be the perfect way to incorporate some of her favorite flavors with a festive color palette for this celebration. I set up a bar in our breakfast room so guests could grab and drink and then head out to the porch to mix and mingle. We’re so lucky it was a warm, sunny day and we could all sit outside. 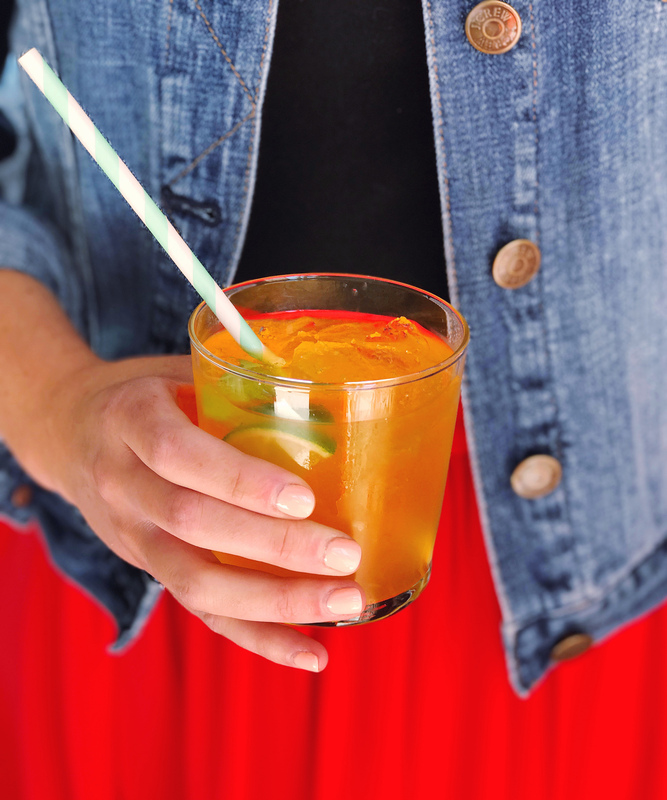 Keeping our colorful fiesta theme in mind, I mixed up a batch of mango margaritas with Jarritos Mexican Soda. For the non-boozing guests (it was a baby shower after all) I served a similar drink without tequila — a mango and lime sparkling agua fresco. 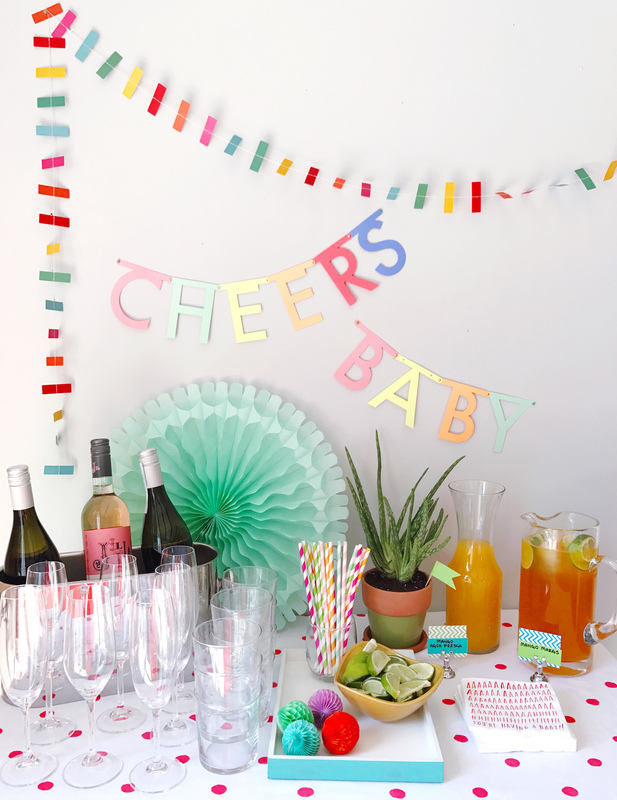 A few bright banners added color to the bar and welcomed guests to clink glasses with my “cheers, baby!” garland. For lunch we had a big taco spread with all of the toppings, street corn salad, spicy chipotle slaw, lime-infused black beans, and a delicious Mexican pasta salad that my friend Krista bought. I think a taco bar is one of the most easy to execute menus for a big luncheon. It’s perfect for a crowd because every one can build the tacos to their liking. 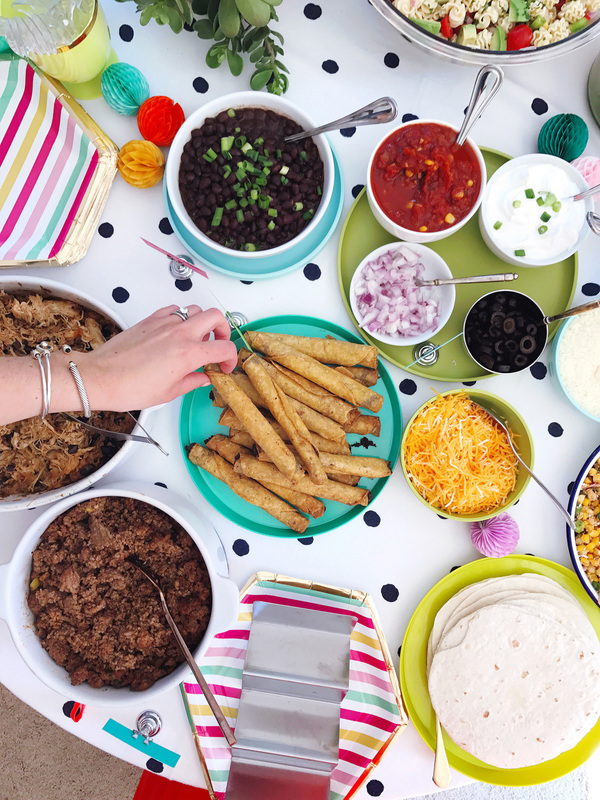 It’s a feast for the eyes with all of the bright colors, plus I really nerd out when I get to use my taco-assembly stand with guests. Our guest of honor loves Mexican food, but her sweet spot is actually sweets. We have a long-standing joke in our friendship about her love of homemade Rice Krispy Treats, and I made a triple batch for this occasion in the form of a tiered cake. 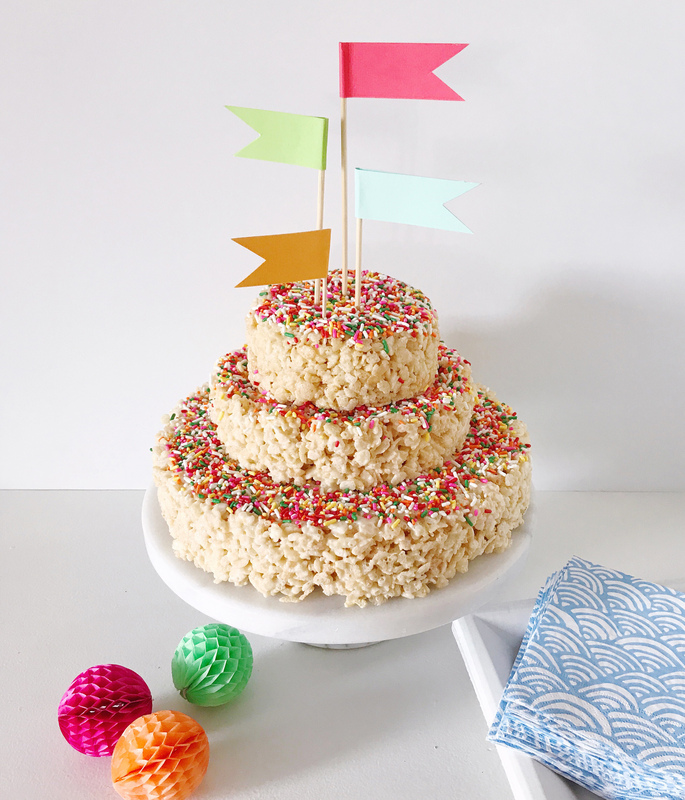 It was actually super simple — I just molded the Rice Krispy treat mixture into three springform cake pans and stacked them together on a cake stand. The festive flags were made on long wooden skewers and helped keep the layers stable as I stacked them on top of one another. Also on the dessert menu: churro cheesecake bites and funfetti cupcakes! Both were made by my friend Colleen and were so delicious. The churro cheesecake bites disappeared from the dessert bar in the blink of an eye! 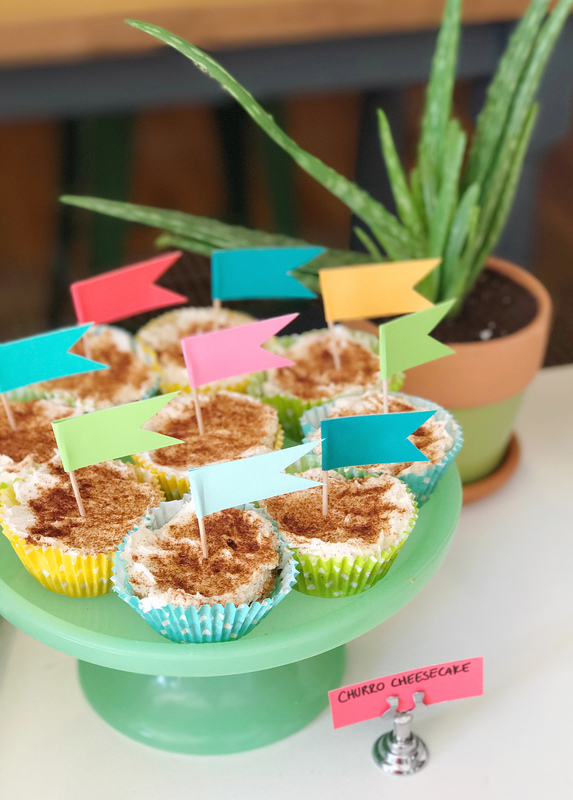 To decorate the dessert bar area, we added colorful flags to all of the desserts, my friend Navya brought lots of cactus and potted plants in bright containers, and in the opening between our kitchen and breakfast nook we added a mobile-like series of paper banners. 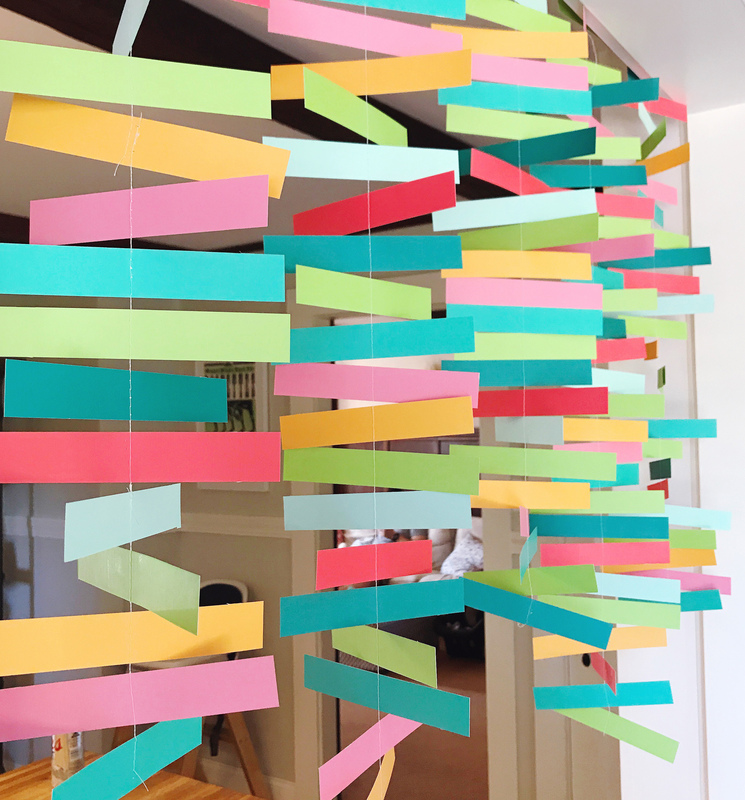 My mom helped me make these spinning paper banners; we cut strips of colorful scrapbooking paper and sewed them together on my sewing machine. Hanging them from the ceiling with some tacks at varying lengths created an awesome, high-impact, and inexpensive decoration for the shower. 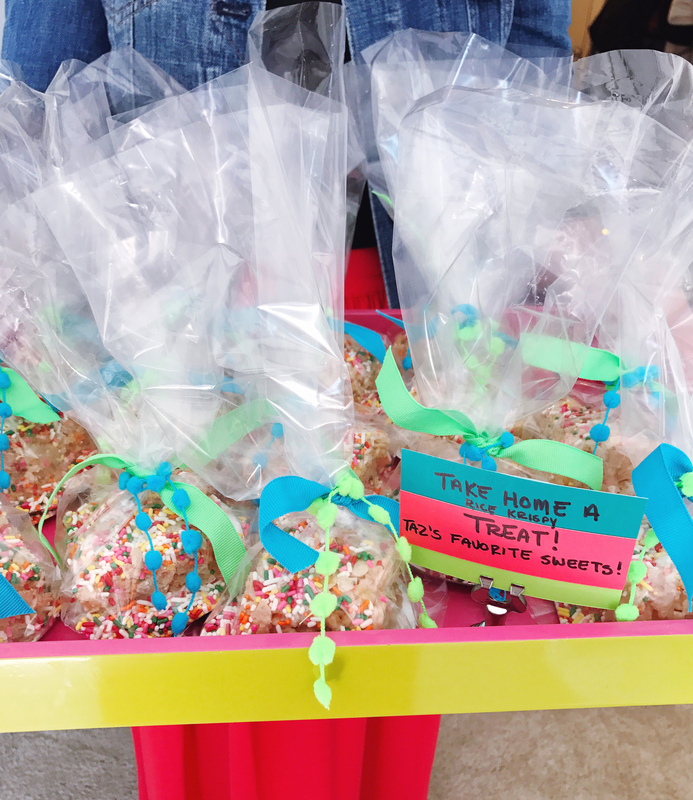 After lots of eating, chatting, and of course, shower gift opening, we sent home guests with their own Rice Krispy Treats in honor of our sweet friend, packed up in clear bags with pom-poms and ribbons! 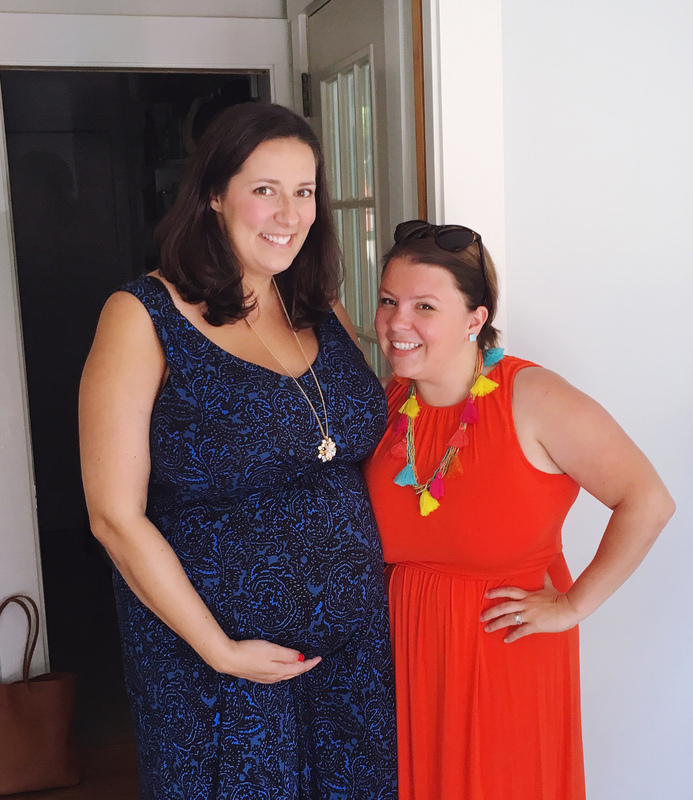 I’m so lucky to have her as a best friend, and can’t wait to have her as a mom-friend too!